New York City is the city that never sleeps. In any given day there is a plethora of activities to do and see. Events for any imagination. It doesn't matter if you are the next big band to be seen by just the right person to make you famous or a small or big business looking to promote your product or service, Bestype Imaging can print what ever you need. Posters, flyers, pamphlets and brochures are all at your finger tips. Manhattan is probably, in this writers opinion, the world's largest billboard, with millions of customers gazing at advertisement 24/7. 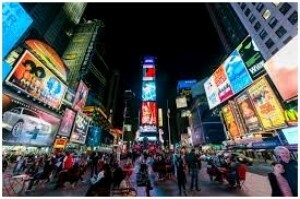 If NYC is the city that never sleeps, it makes sense to have your brand and product or service seen 24/7. There is no better time than now to prepare for your placement, type and size. The city has spent millions of dollars investing in promotions such as Small Business Saturday, around November. There are also so many holidays year round. On any given day it's International 'something" day. it is imperative in such a rich advertising environment to have your name, your band, your gallery or your whatcha-ma-call-it stand out. Being located in the heart of the financial district in Manhattan, Bestype Imaging is local, efficient and proficient in its expertise and delivery of nyc print shop needs. So, when the time comes that you need the Best work done, in the best city in the world, where only New Yorker's understand what it means to be a New Yorker, come see Bestype Imaging.